Years of hard work and dedication paid off for Asphalt Green Unified Aquatics (AGUA) Swim Team athletes Isabel Gormley and Krystal Lara. Both qualified and competed at the US Olympic Trials, held June 26 to July 3 in Omaha, Neb. The star athletes shared the most memorable parts of the experience and what it was like swimming with some of the best in the world. The most memorable moment from Olympic Trials was seeing myself on the Jumbotron, but my favorite moment out of the pool happened on the first night. The microphone for the national anthem wasn’t working, so the entire stadium started singing together. I was very excited to compete but didn’t feel a lot of pressure because I just wanted to have fun. I was racing in the 400-meter Individual Medley (IM). I was amazed by how close we got to the pros—they warmed up in the same pool as us! 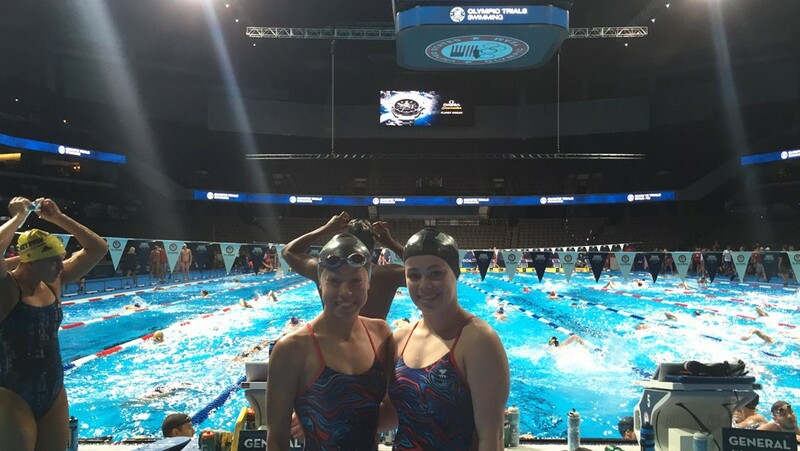 It was great being at Olympic Trials with a teammate. Krystal really supported me and watched me swim. It was very helpful to have support from AGUA and from other teams in our region. Before my race on Sunday, June 26, I stuck to tradition and had the “Gormley Special,” which is pasta with butter, grilled chicken, and broccoli. I watched Netflix and sat in pressure boots to prepare. I have to say that I wasn’t really focused until I entered the ready room (where swimmers wait before racing in big meets). Then, I just listened to Alexander Hamilton a few times until my name was called. During the race, I was really just having so much fun and felt great. I was happy with how I did, despite adding some time to my swim. Overall, it was a very exciting and memorable experience. I’m taking the summer off and coming back in September, but my goal is to qualify for National Select Camp next season. When I was at Olympic Trials, I felt a mixture of emotions. I remember entering the arena, I was in complete awe. The mixture of bright lights and elite athletes all in the same place was breathtaking. I arrived on Friday, June 24. When I landed in Omaha, Neb., I went straight to the pool. On both Saturday and Sunday, I trained in the morning and afternoon. Being there with Isabel was definitely great. Having a companion there to enjoy the whole event is definitely something to cherish. The 100-meter backstroke was the first event on Monday, June 27, so I woke up at 6:30am. My pre-race meal consisted of eggs, oatmeal, toast, and a glass of orange juice. I was in the water warming up at 8am. My race was scheduled for 10am. During my downtime, I stayed at the athlete lounge. They had a smoothie bar, snacks, and even dogs to relieve stress from the swimmers. The most challenging part was not letting the nerves get to me. I have never been in a situation where thousands of people come to watch you swim. I stayed focused by imagining the race in my head and telling myself that I worked extremely hard to get to this point. Competing in the 100-meter backstroke was a phenomenal feeling. During the race, all I can remember was seeing the Olympic rings on the jumbo screen and all the bright lights around me. I was swimming right in the middle of the pool. I remember the last 50 meters of my race, looking up at the screen, and watching myself swim. I saw how close my competitors were to me and began to increase my tempo toward the end. After my race, I felt incredibly happy. Even though I did not swim my best time, I still felt proud that I was able to make it this far. Competing with some of the best swimmers in the nation was truly inspiring. Although I may not be at their level, at least I can say that I competed against Missy Franklin in the 100-meter backstroke! In the fall, I begin the next chapter in my swimming career at Northwestern University. It will be a different experience, but I am excited to start another journey and see how fast I can swim!